In the Tokugawa era, silver mined from Iwami Ginzan provided an abundant source of precious metals good for international trade. Therefore, Japan was able to purchase large amounts of goods (such as firearms) from the European maritime powers. Later in the 19th century, Japan was able to industrialize quickly in the early Meiji period. Although the Iwami Ginzan mine has declined by then, I guess that Japan's rich deposit of precious metals might still have been instrumental in the country's industrialization, as precious metal deposits provided abundant funds for e.g. the furnishing of industrial equipment. Is there any economic history account of the role of Japan's precious metal deposits in the roles of the country's early industrialization? To be specific, what are the numbers? How much did the precious metal deposits contribute to the furnishing of equipment, for example? I am looking for a quantitative answer here. Since the OP found the answer at the comment line by Greg, I would like to submit mine as a supplement. Could you provide us with the evidence of the below statement? Japan was not completely isolated under the sakoku policy. It was a system in which strict regulations were applied to commerce and foreign relations by the shogunate and by certain feudal domains (han). There was extensive trade with China through the port of Nagasaki, in the far west of Japan, with a residential area for the Chinese. The policy stated that the only European influence permitted was the Dutch factory at Dejima in Nagasaki. Western scientific, technical and medical innovations did flow into Japan through Rangaku ("Dutch learning"). The actual volume of the trade Tokugawa Shogunate permitted with Dutch was only half of that of China. From the Sengoku period to the early Edo period, enormous amount of gold and silver ( especially silver ) were produced throughout Japan, so that they were used for trading with non Japanese. In early Edo period, since there is little to export, the trading deficit is extensively red, so that gold and silver flowed out of Japan gradually. In 1604, Tokugawa Shogunate established Ito-Kappu-Seido, which is intended to control the price of import of the silk ( from China ). At the end of 17th century, the volume of the production of the gold and silver declined, Tokugawa Shogunate set the Sa-Da-Me-Da-Ka Trading Law, which fixed the amount of the trading volume with China and Netherland. So that it seems your claim, second paragraph, is completely wrong, since as I emphasized at the bold part, at the end of the 17th century, the volume of the production of the gold and silver decreased, so that there is no evidence Tokugawa Shogunate was so rich enough that they imported firearms under the Sakuku system. And as I explained at the reason 1, 2, during Edo period, only the country except China and Korea was Netherland, so that it is very hard to think like your second paragraph. Please clarify your statement please. It is true that the volume of the production of Iwami Ginzan sharply dropped. 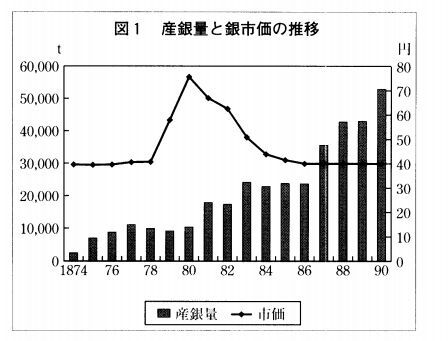 This analysis ( thesis ), which focused on the production volume and price and control by the Meiji Government around 1867 - 1900 does not even list the Iwami Ginzan as the source of the silver. This thesis also provide us with how much silver were produced from 1874-1890. ( The below image ). At the end of Toyotomi Era, at early 17th century, the volume of the production of the silver was 200,000 tons, occupying the third of the volume of the production of the world. So that it was only Early 17th Century Japanese volume of the production of the silver flourished. The state of the Japanese sliver in terms of the volume of the production started to decline since then. To enhance my claim, I would like to present the below. In 1700's, the volume of the production of the silver in South America increased by 10 times compared with that of 1200's and the place where most of the production of the silver was conducted in the world was shifted to South America. From 1500's to 1800's, Bolivia, Peru, and Mexico produced 85% of the total volume of the production of the silver in the world. I guess that Japan's rich deposit of precious metals might still have been instrumental in the country's industrialization, as precious metal deposits provided abundant funds for e.g. the furnishing of industrial equipment. seems to be dubious due to the above reason. Now onto your last paragraph. As I answered at A and B, your assumption that Japan was rich or resources such as precious metals as gold and sliver was rather a myth, but if you yet persist on your claim that we ( Japanese ) were rich of the precious metals, then I would like to encounter showing the evidence below. Okay, let's assume we ( Japanese ) were rich and full of precious metals in terms of modern history. After the defeat of Tokugawa Shogunate in 1868. Meiji Government tried very hard to join the Imperial Japanese into "Establishment Club" ( such as the UK. the U.S, Germany, France, etc. ), the earliest Finance Ministry Of the Meiji Government issued the 新貨条例 ( New Monetary Law ) ( only the Japanese Wiki is available ) in 1871. Relative Abundance Of Silver In Non Japanese Countries Back Then ( In Comparison With Japan ). So your main focal point in your argument is that back then there were abundant of silver so that it became the booster of Japan's industrialization. Is it true? Since ministers of the new Meiji government decided the new coins ( money ) started to be produced at the new Mint Bureau, the Meiji government started to join the industrialized countries, but they were not able to decide which money, either gold or silver should be the standard. Due to the difference of the exchange ratio ( my previous answer ) between gold and the silver, outflow of the gold was enormous, so that there is no enough reserve-gold. However, at Yokohama, like in most Asian countries, the dealing with Mexican dollars were every day business practice, so that Okuma, the Minister Of Finance Of Meiji Government, was considering to take dual-standard system, gold and silver standard. The influx of the silver produced at South America made the price of commodities surged and it became one of reasons of the social transformation in Europe. Previously, Silver has the role of the standard in monetary system, since the explosive increase of the amount of the production ( from South America ) made the price of the silver dropped sharply, therefore the silver became unable to hold the status as the monetary standard. World economic system has begun to shift to the gold standard monetary system which began in the U.K in 1816. The decline of the production of the silver in Japan as early as 18th century was so sharp that the Japan as Zipang, rich and full of precious metal is a myth. The fact that Japan produced enormous amount of the silver occurred merely for a few period, which is from the 16th century to at least the middle of the 17th century, and as I cited many sources, in 18th century, the standing as a country that produce the silver at great amount was shifted to South America. So unfortunately, your premise was broken, though the gold and the silver played a role to certain amount in the industrialization of Japan, it was only minimal, instead as you also know like other countries light industries were the booster of the industrialization. I think you are somewhat misguided by something. Let's take a look at into this site. Translated : Let me explain. ( about the former question ). In other countries besides Japan. the swap ratio between Gold and Silver is 1:15. On the other hand, in Japan, the ratio is 1:5. So your misconception that Japan produced abundant of Silver actually had nothing to do with the "industrialization" of Japan. As you can see, since the ratio of Silver is higher in Japan than other countries, Edo Shogunate tried hard Gold not to be exported to other countries. In Japan, on the contrary to your thoughts, the Silver is more used than other countries. ( See Gold has the advantage if you think of the exchange ratio 1:5 ( in Japan ) to 1:15 ( other countries ( especially in Europe )). What helped industrialization of Japan at its early stage is more on the light industry such as cotton production rather than the relative abundance of the production of silver in Japan. Not the answer you're looking for? Browse other questions tagged economy japan industrial-revolution meiji-restoration or ask your own question. Were there any naval engagements during the Mongol invasions of Japan? Were US exports in the early 1800s paid for with metal or with paper? Did the Nazis have any unique or especially effective economic policies? Were there any pilots that declined to carry out the atomic bombing of Hiroshima and Nagasaki? In the Bakumatsu period, was there any way to identify which clan a person belonged to?